Temptress false eyelashes are designed for special occasions. 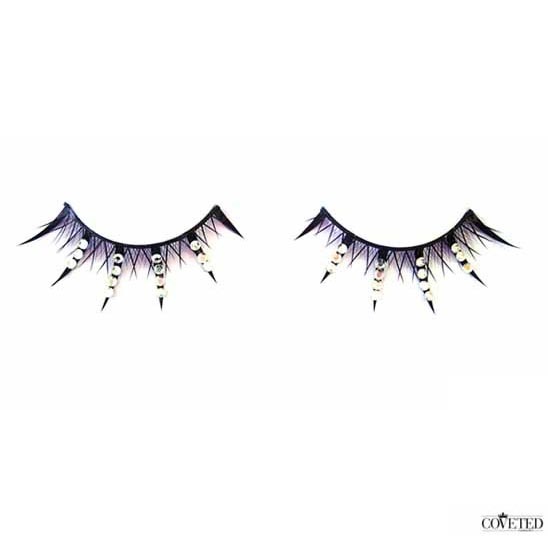 Adorned with crystal beads that are attached to the main lashes, the beads are lightweight while the rest of the eyelashes are shorter drawing immediate attention to the crystals. Made with natural hair and crystal beads, these lashes are perfect to wear with vibrant eye shadows or bold eyeliner. If you were wondering how to wear false eyelashes that are decorative with crystals, you’ve asked a good question. Decorative fake lashes are meant more for special occasions or a big night out and can be a bit over the top for daily usage depending on the person. These fake lashes are perfect for ethnic weddings where the makeup tends to be stronger and more colorful. They are also great for performance such as on stage and TV because the reflective crystals immediately reflect all the light that is shown on them and creates a very attractive effect. Double eyelashes are basically gluing two pairs of eyelashes together for a dramatic effect. This is often used in photo shoots or for performances where you want the eyes to be the main focus. It is recommended that you glue the two pairs of lashes together first instead of putting two pairs of lashes on your eyes consecutively. You may want to double up with the Temptress lashes since the secondary lashes are quite short compared to the main lashes with crystals on them.